Flaxseed, the tiny plant with powerful anticancer properties—why are people so afraid of it? Breast cancer is thought to be a hormonal disease. This means that a hormone may cause cancer to develop by encouraging cells to grow and divide; therefore the mere mention of the word estrogen strikes fear in many. Although the conventional medical community identifies all estrogens, including phytoestrogens, as carcinogenic and surely to be feared, plant estrogens may actually reduce estrogen activity in the body. In fact, phytoestrogens are not really estrogens, they are anti-estrogens. Plant estrogens protect us from the stronger estrogens our bodies produce as well as the xenoestrogens found in environmental chemicals—they actually contain compounds that have been shown to reduce the growth and spread of cancer cells. Flax, being a phytoestrogen, is simply misunderstood. Phytoestrogens such as flax act more like estrogen blockers than like estrogen; flax helps modulate the production, availability, and action of hormones. The lignans in flax lower the production of estrogen by blocking the aromatase enzyme (similar to aromatase inhibitors) and block the estrogen receptors (similar to Tamoxifen–and experts now believe that flaxseed may work even better than Tamoxifen, with side benefits not side effects). When lignans are consumed, intestinal bacteria convert them into enterolactone and enterodiol. They attach to estrogen receptors, stimulate them weakly and block estrogen binding. This prevents estradiol or estrone from attaching to the estrogen receptors and strongly stimulating them, and includes not just the estrogen we produce, but also environmental toxins, thus making breast tissue more resistant to these environmental toxins. Think of it this way. If you flood your system with phytoestrogens such as flax, they have the opportunity to block the receptors and only weakly stimulate cell proliferation. While estrogen may cause 1000 cells to divide, phytoestrogens cause only one cell to divide. Further, because compounds in flaxseed act as weak estrogen imitators, your body reacts by decreasing its production of estrogen. If you have too much estrogen, you may see your estrogen levels drop when you eat flaxseed. Additionally, the estrogens that your body naturally manufactures may be a less active form. Flax also increases programmed cell death (apoptosis), prevents new blood vessels from growing into tumors, decreases hot flashes, decreases HER2 expression (HER2 leads to growth factor signaling pathways that play a role in cell proliferation, differentiation, apoptosis and metastasis), decreases breast cancer proliferation, reduces tumor growth and protects against radiation damage–flaxseed may play a role in mitigating and protecting other healthy tissues and organs before exposure to radiation from x-rays and CT scans, and significantly reduces damage even after exposure. Women who consume 25 grams of ground flaxseed per day showed decreased tumor cell proliferation (up to 30%), decreased HER2 expression (up to 70%) and increased apoptosis. Flaxseed can inhibit the growth of both estrogen receptor positive and negative breast cancer cells. It also reduced metastasis of ER negative breast tumors. Decreased cell proliferation rates, decreased angiogenesis and increased apoptosis seem to account for the decrease. 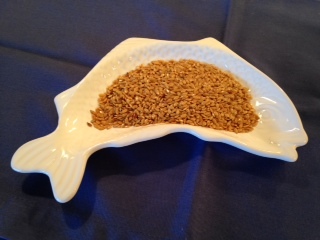 Flaxseed is a rich source of omega 3 fatty acids. Research has found that women who eat the highest amounts of omega-3’s have the lowest risk of breast cancer. Omega-3’s have been found to help shrink breast tumors and prevent them from spreading to other parts of the body. Omega’s also help calm inflammation and decrease the rate at which breast cells divide in response to estrogen. In Confirmed: Flaxseed Contains ‘Estrogens’ That Regress Cancer, Sayer Ji reports on how dietary flaxseed has the potential to reduce tumor growth in patients with breast cancer. As reported by Dr Michael Greger in Flax and Breast Cancer Survival , flaxseeds appear to have the potential to reduce tumor growth in just a matter of weeks and can help to increase survival. In this article, Greger speaks of the first side by side study comparing Tamoxifen to flaxseed to effectively starve tumors of their blood supply. One of the ways the chemotherapy drug Tamoxifen works is by boosting the levels of angiogenesis inhibitors like endostatin, which is a protein the body makes to try to starve tumors of their blood supply. In the study they gave women tamoxifen for 6 weeks; the levels of endostatin within the breast tended to go up, but the same thing happened when they added three and a half tablespoons of ground flaxseeds to their daily diet. This is exciting news and further supports embracing nature in the management of cancer. Please read the article for more studies. MSKCC agrees that Flaxseed inhibits the growth and metastasis of breast and other cancers and can lower tumor biomarkers, and can reduce radiation therapy-induced lung damage and increase survival. Of course, I would like them to rethink the contraindication warning that patients with estrogen receptor positive breast cancer should consume flax with caution as this makes no sense, but then perhaps they are cautious of conflict of interest. You will also find an in-depth discussion on flax in Dr Christine Horner’s book, Waking the Warrior Goddess, Third Edition: Dr. Christine Horner’s Program to Protect Against & Fight Breast Cancer. Flaxseed is easy to eat. While flaxseed oil should not be heated because it can easily oxidize, heating flaxseeds does not measurably change the nutritional content. Grind the seeds and bake them in muffins or add them to your cereal; add them to your smoothie. Aim for 2-4Tbs freshly ground daily. Freshly ground is important to avoid oxidation and in order for your body to digest and utilize flaxseeds, they must first be ground. Need a new idea? 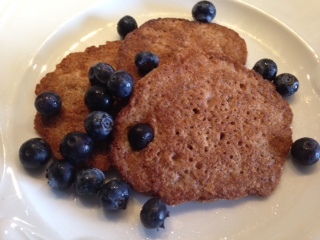 Make some oatmeal flax pancakes. Hemp seeds have gamma-linolenic acid, a powerful anti-inflammatory. They also offer all of the nine essential amino acids your body can’t make on its own, maybe add some chia seeds as well. Still don’t see yourself eating flaxseed daily or travel frequently? Try a supplement: Brevail Proactive Breast Health Capsules, 30-Count Box . While not a perfect solution, it is an option. Grind walnuts (if using) with Flaxseed. Stir into oats. Add remaining ingredients except butter, slightly mashing banana (if using). Warm pan with butter. Spoon batter into pan, making thick pancakes. Yield, 2 large or 4 small. Serve with fresh berries, honey (try buckwheat honey), or topping of your choice. I never overlook an opportunity to allow nature to heal; flaxseed is proving to be one such powerful agent to embrace for breast cancer management and survival. Never sacrifice health for the sake of a cure (old Ayurvedic principle). Treatments should not create imbalances or disease. As we learned during my show with Peter Gotsche (Deadly Medicines and Organized crime-what you need to know about prescription drugs and your health) prescriptions drugs are the third leading cause of death after heart disease and cancer, and most come with the risk of potentially toxic side effects and contribute to further disease, not wellness; drugs do not cure imbalances, they create them. Anytime you can find a natural substance that works as well or better than a pharmaceutical drug, go for it. While a comprehensive anticancer plan is beyond the scope of this post, there is much we can do to support the body against cancer; flaxseed is just one very important part of the puzzle, and estrogen is not the main culprit. Endnote…estrogen is our friend, not our enemy, it’s all about balance, metabolism and management. Part of knowing your options is speaking with the experts who offer more than just the standard of care. How to find them? Visit my guide to Integrative Oncologists and Naturopathic Doctors or schedule a consult to learn more. Click here for more information on Natural Alternatives to Tamoxifen. Find whole flax seed at your local market or health food store or find it here: Bob’s Red Mill Golden Flaxseed, 24-Ounce Bags (Pack of 4) . If you cannot eat flax, consider a flaxseed supplement: NuLignan 90t or Brevail . wowza! thank you for putting this all together Elyn. Almost 5 years ago, I read of a study in Canada, w/ a very legit researcher[ a woman], that said taking flax seed post diagnosis and prior to surgery reduced breast cancer tumor size. later I read tamoxifen does also. but I was so intrigued that flax did! I also read of an Italian community study.., I believe it lasted a few years.., where they gave bread w/ flax seed added, out to women weekly, and followed their health.., which showed fewer cases of breast cancer than would be expected. I wish I had the names, dates etc.., but I have been following what i can of info on flax, as my cancer nutritionist cautions that no more than 1-2 tbs a day is considered ‘safe’. she is pretty open minded, very young, and I have been giving her info as I find it. But as a result, I have waffled and use no more than approx. 2 tbs [ fresh ground frozen organic flax seeds] in my protein shakes that I have almost daily. your info is going straight to her. wonderful work! Thank you so much for your ongoing revelations. You are absolutely right Susan, great fiber and yes, it does help us eliminate estrogen. hi, I’m not Elyn.., but I do keep flax seed in the freezer, and grind it in the electric-push-down grinder for each use. easy as pie;-) I all but collect those grinders at tag sales and e-bay. i find them for $2.50-$10. have one for my husband’s coffee, and another for flax, and have had one for just spices, and give them to peeps who need them for flax seed grinding. Yes, a coffee grinder is perfect, and as long as you clean it (wipe it out well so the residual oil does not go rancid). I keep my seeds in the refrigerator…cool, dark place is the recommendation. Thanks Jennifer, and great idea! I imagine it is great in yogurt too….I don’t eat much these days, but I used to love mixing in wheatgerm, so why not flax. Would flaxseed oil capsules work as good as ground flax? Hi Betty, flaxseed oil does not contain the lignans, which is where the benefit come from. and remember to grind them fresh before use. One of the best articles I’ve found online. Thank you!! I’m curious about your experience specifically with flaxseed use and blood test trends. I’ve seen a case study showing flaxseed lower excessively high serum testosterone in a woman with PCOS, but what about serum estrogen? Have you found in lab testing that the freshly-ground flaxseeds can reduce high serum estradiol (tested at luteal peak) in pre-menopausal women? Thanks again! Flaxseed modulates estrogen, which means it is helpful if your estrogen is too high or too low. I have a large fibroid if not larger than grape fruit, I’ve been doing budwig diet for a week hoping God would use this to shrink fibroid , I don’t want to have hestorectomy. I saw your post and I’m more encourage to take flaxseed oil everyday. Why ground over whole flaxseed? You can eat whole flaxseed, just be sure to chew it thoroughly. When you grind it by machine, mortar or teeth, you get the full benefits. Just don’t by preground as the seeds when crushed oxidize quickly and can become rancid. Are Your Headphones An EMF Health Risk? Is it Safe to Drink Alcohol if You Have Cancer?